Two of the most lauded albums by saxophonist/composer John Coltrane, Giant Steps and My Favorite Things—both released on Atlantic Records nearly 60 years ago—have earned gold status per the standards of the Recording Industry Association of America, having sold more than 500,000 units. 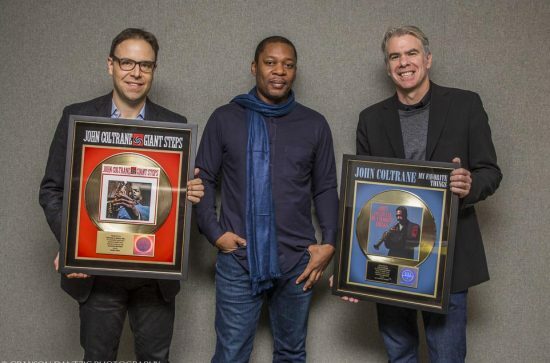 Gold records are, of course, not an honor often bestowed on jazz albums, which makes this certification a testament to Coltrane’s enduring appeal to listeners. This has been a big year for Coltrane, more than 50 years after his death in 1967 at the age of 40. The posthumous release of his “lost album,” Both Directions at Once, recorded in 1963, was a major event in the jazz world and beyond. The gold designation of Giant Steps (recorded in May and December 1959, originally released in January 1960) and My Favorite Things (recorded in October 1960, originally released in March 1961) only serves to further reinforce his profound legacy.